The Blu-ray DVD "Extended Edition" of The Lord of the Rings: The Motion Picture Trilogy is available for pre-order at Amazon for $83.99 [and if you buy it by clicking through from here, "One Eternal Day" will benefit]. Each film in the trilogy will be spread over two discs with additional supplemental discs - fifteen in all. 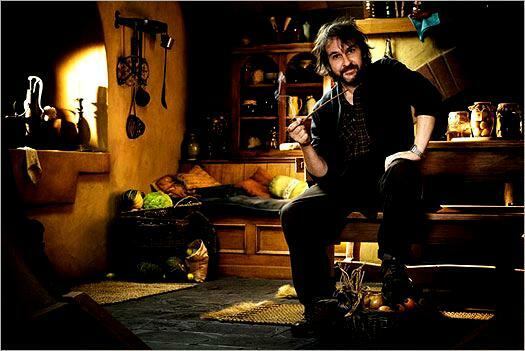 In additional good news for Tolkien enthusiasts, Peter Jackson has begun filming of The Hobbit in New Zealand [see also here]. The much thinner Jackson is below, apparently inside a set for Bilbo's Bag End.